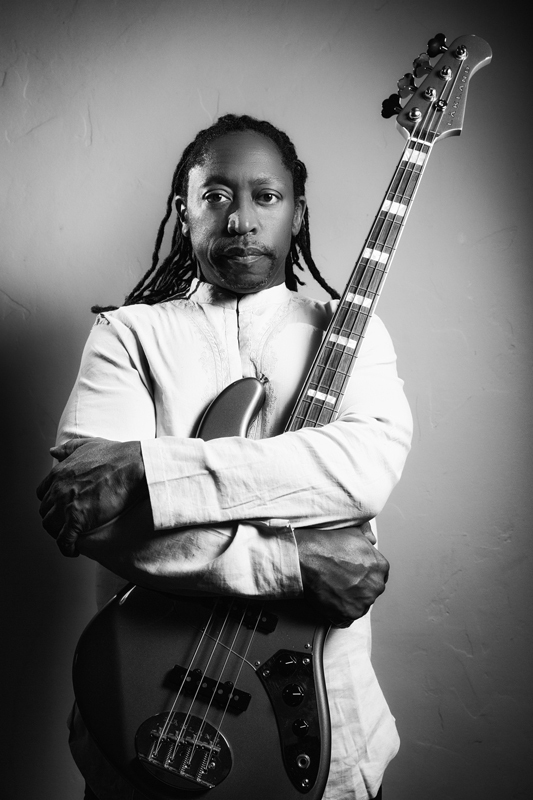 Born on the south side of Chicago, Darryl picked up the electric and later acoustic bass, and within a couple of years, his reputation for loving the function the bass serves and his dedication to the groove got people talking. He started playing in a local band alongside pianist Ken Chaney and guitarist Phil Upchurch, and on occasion, drummer Vince Wilburn, Jr. who turned out to be jazz legend Miles Davis‘ nephew. Wilburn recommended Darryl to his uncle; at age 21, a try-out in New York was arranged and Darryl promptly landed the gig. Darryl appeared on such ’80s-era Davis recordings as 1983’s Decoy and 1985’s You’re Under Arrest. Moving to New York City, he quickly built a name for himself in the local jazz scene where he played and/or recorded alongside his fellow bandmates in Davis’ band. When Police frontman Sting embarked on a solo career and picked up the rhythm guitar, he turned to Branford Marsalis for a bass referral, and Marsalis recommended Darryl. Darryl played on the Dream of the Blue Turtles album, appeared in the documentary film Bring on the Night, and the subsequent album and world tour. Always open to new musical experiences, he toured and recorded sessions with Peter Gabriel, Herbie Hancock & the Headhunters, Madonna, Eric Clapton, Ryuichi Sakamoto, and more. In 1993, he landed the gig as bassist for the Rolling Stones, replacing longtime member Bill Wyman. Darryl has been in the group ever since, appearing on such studio recordings as 1994’s Voodoo Lounge and 1997’s Bridges to Babylon, as well as numerous tours. Between touring and recording, Darryl guests with other artists like Lee Ann Rimes, Rod Stewart, and is a co-leader on projects, including Three Brave Souls with John Beasley and Ndugu Chancler and the new Chi-Town Social Club, with longtime friends Vince Wilburn, Jr., Nicholas Tremulis (who also serves as Darryl’s music director for his solo work) and Shawn Christopher (Sonia Dada, Chaka Khan). He also performs with Wilburn Jr. in the Miles Electric Band that revisits and renews the musical innovation of the legendary Miles Davis. Darryl also continues his composing work, he scored Sundance winner Love Jones. Darryl Jones: Like a Rolling Stone Documentary Trailer from Rick English on Vimeo. What’s been keeping me up at night mostly is the sheer tonnage of things about which I’d like to educate myself. There’s so much to learn. I’m infinitely curious about so many things and I’m not the quickest study so I have to spend time taking things in. For instance, I love cooking but I don’t yet know how to make an omelet. I should mention that I don’t eat eggs but a proper cook should know how to make a great omelet, right? I’m excited about so many things. I’m working on a documentary about my life and career. I’m beginning to get out and perform music I’ve written after so many years of working with others. I took part in a workshop this past summer hosted by The Sundance Institute which pairs composers with filmmakers to work on a scene and present it to successful film composers who act as advisors. It’s a very intensive week. I learned so much and it reignited my interest in film music after scoring a film more than twenty years ago. I can’t help but think about my parents when considering this question. I don’t know if I’ll ever lose the feeling that everything would be better if I still had the wise counsel and affection of my parents. As far as musicians on my team, Miles Davis as player and producer, Kenny Kirkland on piano and Hiram Bullock and Darryl Thompson on guitar. Good question! I’m not sure. Maybe “From The Heart.” Or “Berocas y Corazón” which I think means “Balls And Heart.” Sounds better in Spanish. Darryl is one of the most talented, charismatic, generous and humble gentlemen in the business of music that I have ever come across. If anyone deserves to be in the limelight and receive accolades it’s Darryl. I wish him every success with every endeavor he attempts to do. I cannot wait for this documentary to come out. I am so proud of him. He embodies every positive character trait a musician could possess. I wish him every success.